Known as the fourth president of the United States, as well as being renowned for his political philosophy and participation in the founding of the US Government and the Constitution, James Madison was born on March 16, 1751. Madison was often referred to as the "Father of the Bill of Rights" Madison was the author of the first ten amendments of the Constitution and believed fervently throughout his political career that a system of checks and balances was required in any government to protect individuals from potential tyranny on behalf of a majority. Born in Port Conway, Virginia, Madison was the oldest of seven surviving children of James Madison Sr. and Eleanor Rose Conway. Both parents contributed in the upbringing of James Jr., and shaped his political ideas towards individual rights and the responsibilities of government. Madison worked towards establishing religious freedom in his state of Virginia from a young age. Notably, he defended Baptist Preachers who found themselves facing charges for preaching without a license issued by the Anglican Church. He also supported guarantees written into the Virginia constitution which allowed for religious liberty. His continuing work on religious freedom contributed to the creation of the Virginia Statute for Religious Freedom which removed the Church of England from a position of prominence in the colonies and removed a State's power to compel its citizens in religious issues. After the Revolutionary War, Madison proposed the radical idea of a three-part federal governmental system that is still in use today and became an integral part of the new American Constitution. Madison imagined the federal government taking a more prominent role that could overrule individual state mandates when deemed to be incorrect or unjust. Madison was jointly responsible for the formation of the Republican Party, along with Thomas Jefferson which opposed the political views of the Federalists. Later serving as Jefferson's secretary of State, Madison oversaw the Louisiana Purchase. As the fourth president of the United States, Madison presided over the War of 182 with Great Britain, which caused him to re-evaluate and change his mind on many of his previous political positions including the formation of a strong military presence as well as a high tariff to aid in the protection of factories that were started during the war. Madison collaborated with John Fay and Alexander Hamilton in composing the Federalist Papers, which succeeded in amending the formerly weak Constitution. Although not accepted in his day and age, his ideas and insights came to light and became an integral part of American politics in the pluralist ideas of the 20th Century. James Madison worked tirelessly from his term in the First Congress through the Fourth Congress to both establish and maintain his Bill of Rights which focused on individual rights and responsibilities under the new Government. 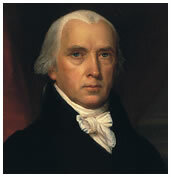 Madison was known to persist in his persuasions of his colleagues in order to have his proposed 12 amendments passed. In 1791, the remaining ten amendments were accepted and became the Bill of Rights, but was not added as he wished into the body of the Constitution itself, and only later would be applied to individual states.